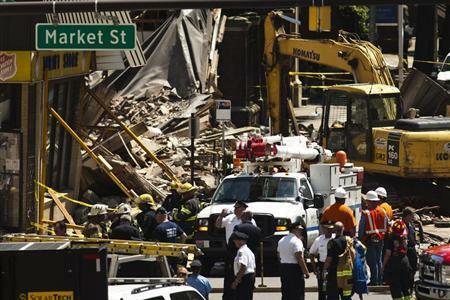 PHILADELPHIA (Reuters) - A demolition contractor was charged with murder on Monday for his role in a June building collapse in Philadelphia that killed six people, authorities said. Businessman Griffin Campbell, 49, used an unsafe method to tear down a four-story, century-old building along busy Market Street in downtown Philadelphia, according to a grand jury report. Campbell should have hired a large crew to remove bricks and beams by hand, due to the proximity to occupied buildings, but instead relied on heavy machinery, the report said. He also removed key building supports in an effort to salvage as much of the building material as possible for resale, the report said. The June 5 collapse sent piles of bricks and lumber onto a neighboring Salvation Army store, trapping shoppers and workers. In addition to the six people who were killed, another 13 were pulled from the rubble, some with severe head injuries. One victim lost both legs. "It would appear, quite frankly, that the motive is greed," Philadelphia District Attorney Seth Williams said at a news conference. Campbell, the lead contractor, was charged with six counts of third-degree murder, 13 counts of reckless endangerment, criminal conspiracy, causing a catastrophe and other charges. Earlier this month, Campbell Construction, along with S&R Contracting, was fined a maximum total of $397,000 by the U.S. Occupational Safety and Health Administration for failing to follow "basic safety precautions" that could have prevented the collapse. Campbell is the second person to be charged in the collapse. Kary Roberts, who also is known as Sean Benschop, a construction worker who was operating the heavy machinery, was charged earlier with involuntary manslaughter and reckless endangerment. He is the head of S&R Contracting. The grand jury that brought the charges against Campbell added a count of criminal conspiracy against the equipment operator as well. Williams said the grand jury was continuing to investigate the collapse. A lawyer for Campbell did not immediately return calls for comment.